Currently, electric bicycle, electric tricycle and electric mobile have been widely used in the big cities. The extensive use of these transports lies in two similar features. On the one hand, they are all powered by electricity, which causes no pollution to the air. On the other hand, using these vehicles can save them quite a sum of money. Nevertheless, the performance of their batteries turns out to be rather dissatisfactory, which becomes an annoyance for consumers. With the top-quality batteries and innovative design, the intelligent self-balancing scooters by FOSJOAS emerges as an impeccable transport to solve the problems of traditional electric vehicles. 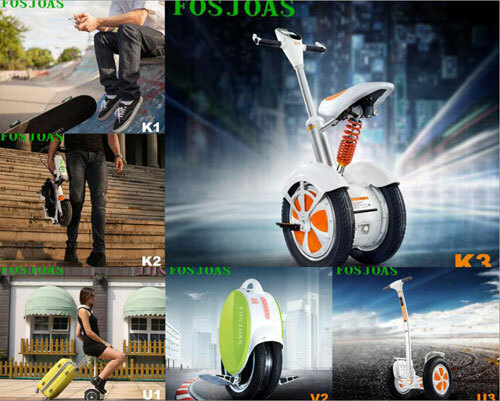 Even though FOSJOAS self-balancing scooter is also an electric vehicle, it is quite different from the traditional electric vehicles in terms of driving force. It adopts the lithium-ion batteries imported from Sony, which has larger power capacity than other batteries. This kind of battery is able to support the vehicle to travel as long as tens of miles. Such adequate power is sufficient enough to meet the needs of ordinary people in the daily life. Apart from that, the durability of batteries adopted by FOSJOAS electric scooter is rather outstanding. Generally, the traditional electric bicycle and electric mobiles are also able to perform well at first. However, after a while of use, they are likely to age and dysfunction. On the contrary, FOSJOAS electric scooter is much more durable than those. Its batteries have a lifespan 3.8 times as long as that of others. It can absolutely stand the test of time. Moreover, FOSJOAS electric scooter is rather excellent in terms of operation. It is designed according to the principles of aerospace attitude control theory, fuzzy algorithm and gyroscope system. Riders just need to shift their body gravity center so as to steer the vehicle, which is rather easy and simple for common users. Undoubtedly, FOSJOAS self-balancing electric scooter is an outstanding transport which speaks for itself with its performance.